Watched the Moscow circus down at the Boardwalk. We’re cheap…parked free downtown and walked a mile to get there. Finished our first Life Group leader training with a final potluck. Groups are launching the week after Labor Day with another cluster launching in October. Booed Bonds hitting #756 while at said potluck. That didn’t make me very popular. Ordered a whole bunch of new equipment and scheduled getting some better speakers hung and our santuary tuned up. I gained some weight. Bummer. Check out the video here to see how much. I got my free copy of Photoshop! 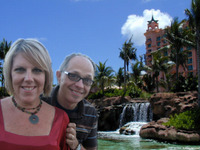 Was working on Life Group sign up stuff and thought I’d goof around real quick and send Ed and Julie to The Bahamas. They deserve it! Lost another Softball game. We could very well go winless this season. ’68 Bucs! Wrote a ten page paper on Baptism in the Holy Spirit, a book by Koo Dong Yun. Billy – Our IT guy works for Adobe. Gets the software cheap and gives it away to churches as his ministry. Mom – Not premature at all…I was still under 160!! I guess the victory dance was a bit premature. It was great fun though and I know you’ll do better this week. I love you! I’m with you – Bonds is a roid monster! How’d you get a free copy of photoshop?